I wrote this story for the Dallas Morning News. It was published on March 9, 1997. MEXICO CITY – Like a major corporation, it has a chief executive, division bosses and distributors. It generates billions of dollars and employs tens of thousands of workers. But it’s not a Fortune 500 company, and it’s not listed on any stock exchange The Mexican Drug Federation, as U.S. agents call it, is a coalition of savvy, brutally efficient gangs, smuggling tons of cocaine, marijuana and heroin to the U.S. every year. And if Mexican authorities want to even challenge the federation’s immense power, they must make radical changes in their anti-drug strategy, according to American law enforcement analysts and U.S. intelligence reports. Mexican President Ernesto Zedillo “can’t consider this as another political blip,” said Robert Nieves, former head of international operations for the Drug Enforcement Administration. “Drug traffickers with this kind of power are a threat to democracy. ” Led by a shadowy trafficker named Amado Carrillo Fuentes, the federation’s smugglers are more sophisticated, better organized and better financed than any of the country’s law enforcement agencies, drug trade experts say. And they spend their money wisely, buying off scores of key officials and agents along their transportation routes, said a U.S. intelligence report titled Amado Carrillo Fuentes and the Mexican Drug Federation . “These smuggling organizations have increased their probability of success by buying protection for their loads. This protection cost, like any other business expense, is considered part of the price of moving drugs through Mexico and into the United States,” said the report, which details Mr. Carrillo’s alleged illicit activities and gives a history of the federation. The federation’s ability to buy off or otherwise escape the law is complicating Mexico’s efforts to convince American politicians that the government is serious about its anti-drug efforts. The U.S. House of Representatives is set to vote later this week on whether to reverse President Clinton’s decision earlier this month to certify Mexico as a country that is fully cooperating in the anti-drug fight. Decertification could mean that Mexico would lose some trade and economic benefits. Critics of Mexico’s anti-drug efforts say they want the country punished because its judicial system seems incapable of bringing drug traffickers to justice. Among the recent setbacks: A judge threw out drug charges against Hector “El Guero” Palma, a major trafficker arrested in 1995; Humberto Garcia Abrego, an accused big-time money launderer, was allowed to walk out of prison; and Mexico’s top anti-drug official, Gen. Jesus Gutierrez Rebollo, was jailed on charges of taking drug payoffs.er agencies. The smugglers’ economic muscle makes them difficult to defeat. Traffickers generate anywhere from $10 billion to $30 billion per year and employ an estimated 138,000 people in illicit crop cultivation alone, Mexican analysts say. 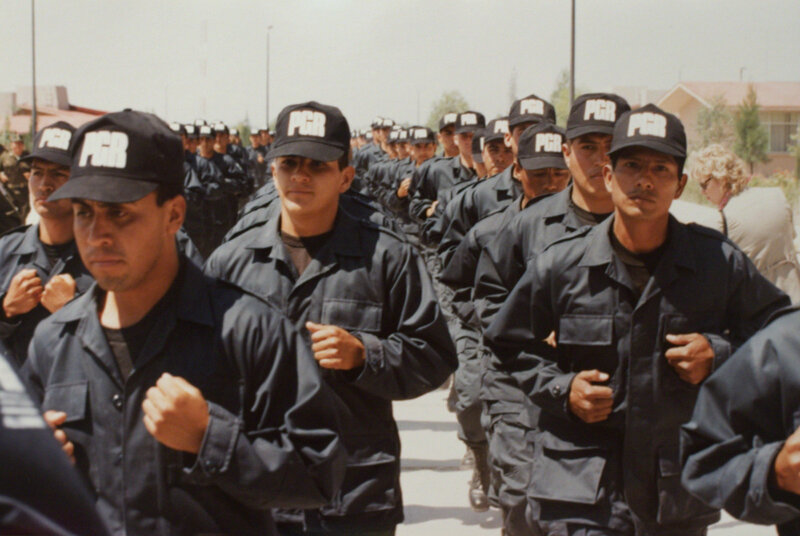 The Carrillo gang – along with the Arellano Felix brothers and the Caro Quintero family – are among the most powerful and feared of the federation’s traffickers. But they represent only a small part of the trade. At least 20 traffickers have regional or statewide clout, and more than 100 smuggling clans or families operate along the U.S.-Mexico border, said Peter Lupsha, a retired University of New Mexico professor who studies international organized crime. In all, the traffickers smuggle several hundred tons of cocaine, as much as 7,100 tons of marijuana, and at least five tons of heroin across the border every year, U.S. officials estimate. The gangs rely on business, family, government and especially police contacts to smuggle their cargo. “Smuggling operations in the northern states of Mexico are hesitant to transport loads without the security and protection purchase from the Mexican Federal Judicial Police, or MFJP. Drug traffickers in Northern Baja have said they’re afraid to try to move drugs without MFJP protection,” the U.S. intelligence report said. Mexican authorities say they are trying to clamp down on traffickers and point to some notable successes. In 1996, they fired more than 1,250 federal judicial police officers, seized a record 1,006 tons of marijuana, and destroyed 92,360 acres of marijuana and poppy plants, more than any other country. Another success was the January 1996 arrest and extradition of Juan Garcia Abrego, leader of the Gulf cartel and a member of the FBI’s Ten Most Wanted List. Mr. Abrego, accused of masterminding multi-ton shipments of cocaine to the United States for many years, was convicted in a Houston court and sentenced to life in prison. Mexican authorities struck out at the Gulf cartel again last month, arresting Oscar Malherbe, who had allegedly replaced Mr. Abrego as head of the drug gang. U.S. agents say that although the damage to the Gulf cartel has been significant, Mr. Carrillo has moved aggressively into Mr. Abrego’s former territory and drugs continue to flow unimpeded across the border. A look at the Mexican Drug Federation provides insight into how dismantling drug cartels can be an elusive goal. While some traffickers have intense, sometimes murderous rivalries, many work together in the federation, which the intelligence report describes as more of a loose alliance “than a regimented organized mafia group or cartel. These so-called alliances or cooperative efforts between various traffickers in moving large drug shipments are documented by all levels of law enforcement. ” “The federation,” the report continues, “can best be described as a corporation similar to one of the major automobile manufacturers. It has a CEO with subordinate divisions below which handle all aspects of the corporation. Below the division are distributorships which work independently for profit but collectively in furthering the business of the operation. ” As business-like as the federation is, it is also very much a family affair. Fathers, sons, uncles and cousins have perfected the art of smuggling over many decades. These tightly knit clans have vast experience – unlike most of Mexico’s top anti-drug officials, who are frequently fired in headline grabbing shake-ups. “The immense size and close unity of these family-run organizations present formidable obstacles for law enforcement officials,” said another document, a DEA briefing paper on Mexican traffickers. One of the most notorious family-run gangs is headed by brothers Ramon and Benjamin Arellano Felix. The Tijuana-based group is believed to control most of the smuggling along the Pacific Coast into California. traffickers, Mr. Caro Quintero wields power through his relatives, agents say. But for many anti-drug agents, Mexico’s No. 1 trafficker remains Mr. Carrillo, the federation’s “premier patron. ” Mr. Carrillo got his start in smuggling through his uncle, Ernesto Rafael Fonseca Carrillo, one of the founders of modern-day trafficking in Mexico, U.S. agents say. “Some of his strong points are his ability to understand all facets of logistical operations and his historical ability to maintain amicable relationships with all levels of the federation,” the U.S. intelligence report said. Another strength is Mr. Carrillo’s alleged direct ties with drug suppliers in Colombia, Peru and Bolivia. “Amado is the only Mexican trafficker who has moved from being a small-time dealer to a regional, then national and now a transnational drug trafficker,” Mr. Lupsha said. But even some little-known Mexican traffickers have considerable influence, anti-drug agents say. For instance, the Herrera organization in the state of Durango is estimated by the DEA to have some 5,000 family members. The group’s members operate everywhere from northern Mexico and Texas to California, Colorado, New York and Illinois. The Herrera organization for decades has controlled opium poppy and heroin production in Durango state and heroin smuggling into the United States despite the fact that the group’s leaders, Jaime Herrera Nevarez Sr. and his son, Jaime Herrera Jr., have been jailed in Mexico since 1987, DEA agents say. To crack down on such families, American agents say Mexican authorities must take strong, decisive action, prosecuting government corruption at all levels, developing a professional police force and strengthening organized crime laws. And the anti-drug effort must be relentless, well-financed and permanent, U.S. agents say. “This is an extraordinary problem, and it requires extraordinary solutions,” said Doug Wankel, former chief of operations for the DEA. “What we’re seeing is the Colombianization of Mexico.